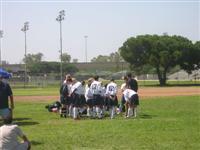 As a coach of the U15 boys I've been involved in many games that were horribly officiating. But one of them stands out the most. Couple years ago we went to a tournament in California. Our first game. Ref seemed to be ok' for the first 15 minutes, you know typical for this level, had not made any significant mistakes. Just few weak calls here and there, nothing major. Before the half time 3 red cards: 1 for my player and 2 for the opponents. For any, even the most innocent foul he was issuing yellow cards or in one instance, straight red for foul from behind. It was so ridiculous. Nobody was killing anybody, just typical soccer game with typical for this age fouls, handballs etc. Those boys were not even 13 years old. Most of them had never got a yellow card before. I was biting my tongue and tried not to explode, knowing that I can only make it worse. I also had to keep some parents in place. During the half time I wanted to go and tell him off but I knew I had 12-13 years old wandering what my reaction would be to all this madness and I couldn't give them a bad example. I ask them to play their game and be quiet. I told them I would take care of it after the game with the Field Marshall. Unfortunately not much had changed in the second half: two more red cards, one for each team and I don't even know how many yellow. Coach from the other team was furious. I didn't blame him. Right after the game was over, we didn't even bother to talk to this ignorant, we found field Marshall, explained the whole situation and got it resolved. There was no chance to replay the game of course but we got our players cleared out from those stupid red cards. Otherwise, five young kids wouldn't be able to play in next two games, which could have been the remaining of the tournament, for us at least (we didn't make it to the QF). Careful what you ask for? I suspect the coach's attitude was reflected in the players on the field's behavior. I also suspect the coach is far from knowledgeable about the rules of the game. Worse, unless he could personally arbitrate those rules, I rather suspect he wouldn't respect anyone else doing so. For those who cannot accept authority(except his own), please be careful! One may be Tasered or shot in carrying this behavior over in the real world. Are you parents letting this man train your children? Providing some useful information in this game, can play a vital role for everyone. I like that my youth soccer guide blog and i wan to share few important posts from that blog and also share our essay editing service which are totally based on online process, out payments methods is also secured. Join in and write your own page! It's easy to do. How? Simply click here to return to TOTW - Bad Officiating.